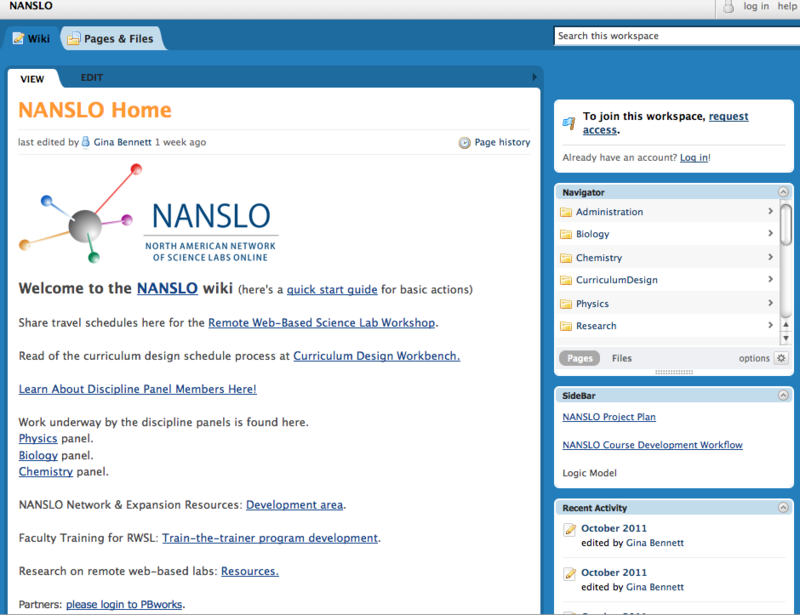 As reported April 2011 in my Up For the Challenge post I’m involved in a Next Generation Learning Challenges project called the North American Network of Science Labs Online (NANSLO). We just completed a two day workshop at North Island College that brought together everyone involved to demonstrate the remote web-based science lab infrastructure being used for some of the labs, status progress, and build momentum toward next steps. Science, Technology, Engineering and Math (STEM) education is a hot topic across North America as graduates from these fields are needed to bolster and advance economic development in both Canada and the US. Teaching science online is particularly challenging so I thought I’d report out on what we’re doing as a way of helping others pursuing the development of lab-based science courses online. Part of this support went toward establishing an observatory at Tatla Lake. 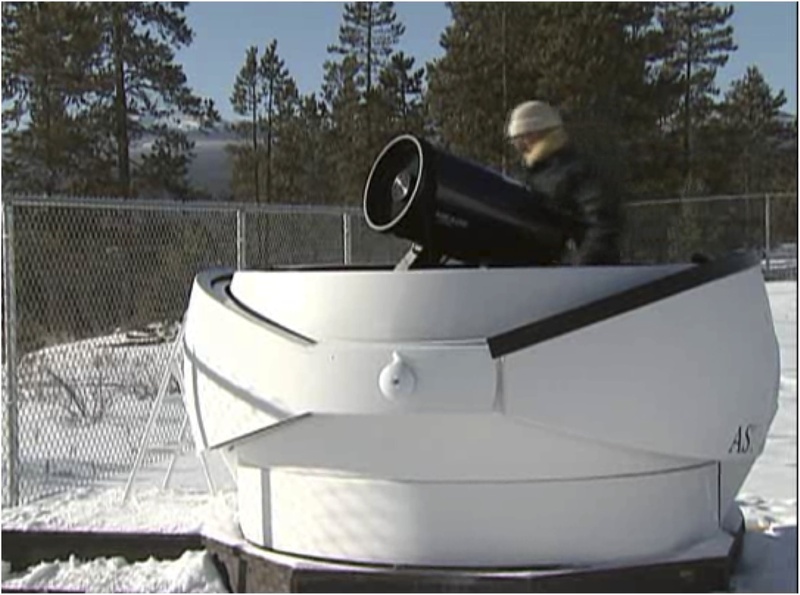 Students can use the observatory’s telescope and CCD Detector for labs acquiring astronomical images using just their web browser. 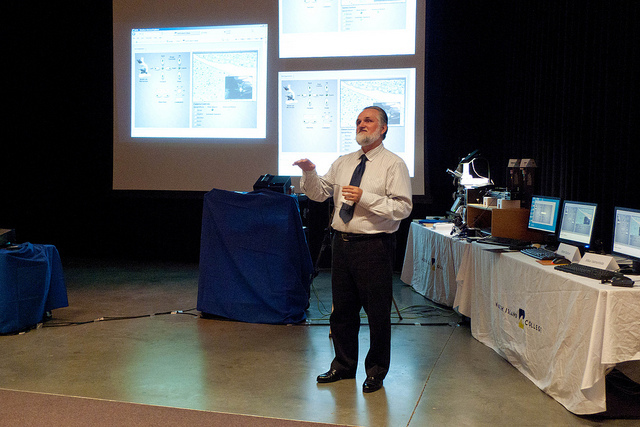 Remote-control of real scientific instruments over the Internet has been an integral part of subsequent online science course development efforts here in BC. Additional rounds of BCcampus Online Program Development Funds supported development of biology, chemistry, physics and geology online courses as well as hardware and software for use in remote web-based science labs. There is plenty of coverage these days about faculty resistance to online learning – see here and here for example. There are lots of skeptics especially around teaching science online. One of the main sticking points is doing labs online. 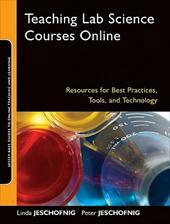 I highly recommend the book Teaching Lab Science Courses Online by Linda and Peter Jeschofnig. These challenges impede adoption, use, and agreements for articulation and transfer. Teaching science online requires innovations for the laboratory component of courses. The two primary means by which the science labs have been done online so far are simulations (see here and here for example) and lab kits (here and here for example). BC’s contribution to the field is a web-based innovation called the Remote Web-based Science Lab (RWSL). The RWSL innovation is a unique and different approach to what has historically been used. Instead of simulating a lab or providing a lab kit for the distance education student to use at home, the Remote Web-based Science Lab allows students to perform experiments by remotely controlling real lab equipment over the Internet. The idea of web-based remote control of real lab equipment and instrumentation is cutting edge and novel but not without precedent. Unmanned deep-sea submarines and Mars rovers have conducted experiments through remote control instrumentation. Surgeons remotely access surgical robots to perform surgery on patients who are thousands of miles away. The challenge with RWSL is to implement this approach for experiments in online science courses at a cost factor and scale that provides faculty and students with widespread access and effectively achieves the required learning outcomes. RWSL attempts to leverage the power of successful lab experiments that are currently used in traditional settings and make them available to students remotely. This has never been done before and is largely what attracted interest from our US partners in the NANSLO initiative and the Next Generation Learning Challenge grant. I expect you are all still trying to wrap your mind around just what the RWSL is. So let me elaborate. The observation component involves a series of cameras that are setup in the laboratory environment and provide students and faculty with a view of the lab and the specific equipment being used. Some of the cameras let the students pan around the room, tilt up or down, or zoom in and out. Other cameras are small inspection cameras for tasks such as looking through the view finder of a microscope. 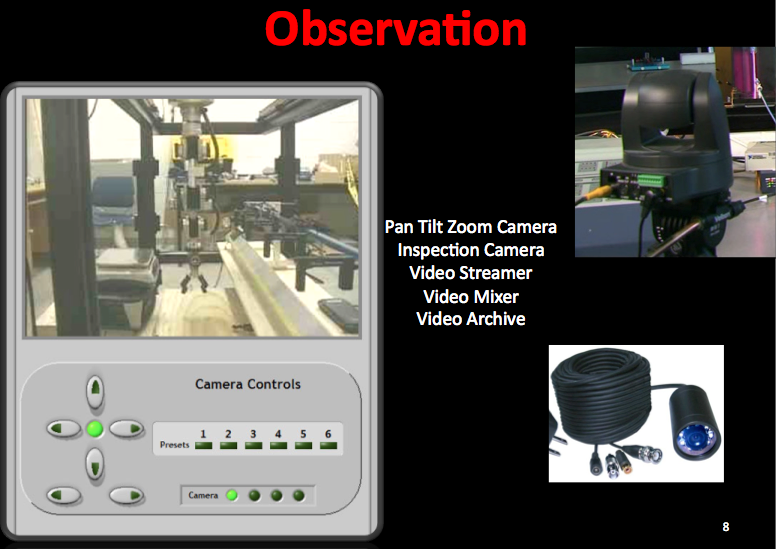 In the image above you see one of the pan/tilt/zoom cameras we use in the upper right and an example of a small inspection camera in the lower right. The image on the left is what a student sees on their screen. The video image from the camera is shown as well as a set of controls. The controls on the left give the students the ability to pan, tilt, zoom. To the right are controls that let you jump cameras to pre-set views and along the bottom are controls that let you toggle between multiple cameras. This observation interface is created as a virtual instrument using National Instruments LabView software. The physical manipulation aspect of the RWSL provides students with the ability to actually operate and control instrumentation. 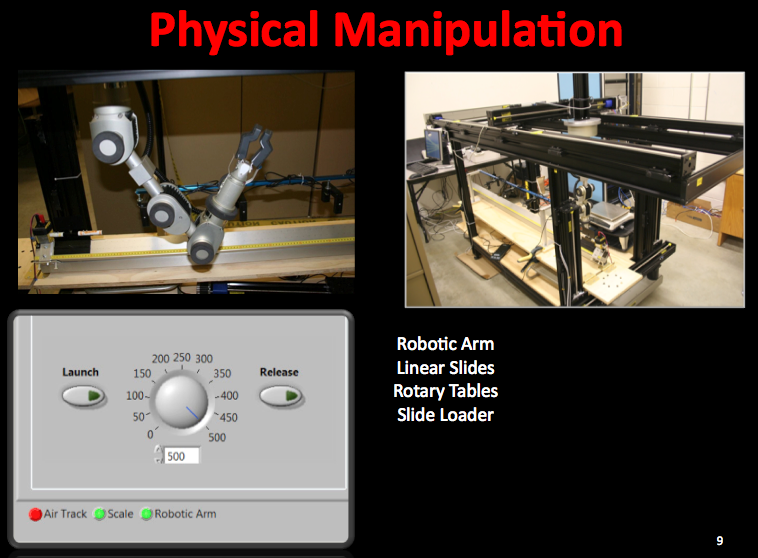 Some experiments involve picking up, moving, and placing items using a robotic arm such as the one shown in the image above. Other experiments involve physical manipulation and movement using linear slides and rotary tables. A motor driven linear slide allows you to move and position something along a linear x or y axis. A rotary table gives you the ability to position something along a circular path. A slide loader is a mechanical device that can be attached to nearly any microscope. It is computer controlled, and can load slides into the microscope without needing physical handling by a lab tech. Not every experiment requires all these devices. The specific way physical manipulation is done varies from experiment to experiment. 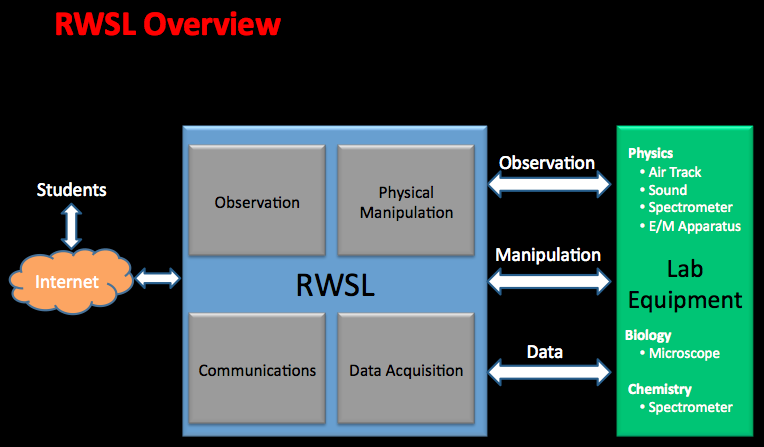 In addition to being able to observe and physically manipulate lab resources the RWSL provides a means for data acquisition. In the image above (you can click on all images to make them bigger) we see a setup for a chemistry or physics experiment using a spectrometer to analyse properties of light. The photo at the top shows a pan/tilt camera in the lower left providing a view of the gas filled tubes shown in the student screen shot view in the bottom right. A small inspection camera at the end of the blue cable in the photo is mounted on a linear table that can move left and right in front of the gas tubes. Students use linear table controls to physically manipulate the position of the inspection camera in front of one of the gas tubes and fire the tube which then emits a light. 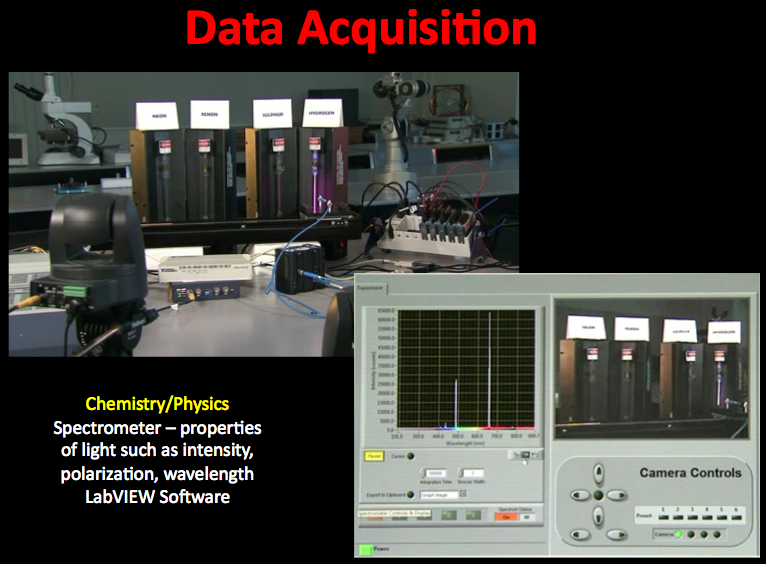 The blue cable feeds the image of that light from the inspection camera to the spectrometer box where data on the intensity and wavelength of the light source are processed and displayed graphically, as is seen on the left panel of the student screen shot view. Students can download both the raw data and the graph to their own computers for more detailed analysis (determination of what gas is in the tube for example) and inclusion in their lab reports. The communication part of the RWSL provides for student to student or student to instructor communication while the experiment is being conducted. The RWSL can be used by groups of students (3 to 5 students/group) working together on a lab. The dialogue among students while doing a lab is seen as an important part of the whole experience as is the potential for an instructor or lab tech to communicate with the students. RWSL communication can be fulfilled in a variety of ways (we’ve not yet landed on one particular way). A 1-800 phone line could be made available or web-based communication through text chat, or voice and video communication through Elluminate, Skype, Google+ or other such tools used. If web-based communication is used one consideration is keeping its use of bandwidth to a minimum so that the computer processing associated with observing, physical manipulation and data acquisition is not adversely impacted. While the RWSL aspect of NANSLO is especially interesting and innovative I’m actually equally enthused about the project for its Open Educational Resources (OER) approach. Through BCcampus support development of online courses in physics, biology and chemistry were underway in advance of NANSLO and licensed as OER using Creative Commons. Through NANSLO project support, Colorado Community College System (CCCS) online physics, biology, and chemistry courses are being meshed with the existing BC OER courses to create best-of-breed versions of these courses. These new courses will be made freely available to others as OER using Creative Commons licenses as specified by the Next Generation Learning Challenge. For me one of the best parts of the course development process has been the formation of multi-institutional discipline panels for each of biology, chemistry and physics. Faculty members from across BC’s public post secondary system have been working with faculty from Colorado, Montana and Wyoming to examine both the BC and Colorado courses including the labs. Some faculty are from two year institutions, some from four year institutions, with the hope that this mix will help smooth the way for articulation and transfer agreements for these courses. Some faculty have been teaching online for quite a while others are skeptics so the dialogue is fascinating. Discipline panel members were provided with comprehensive comparisons of BCcampus & CCCS online course curriculum. They’re comparing course overviews, learning outcomes, topics, textbook, hours of study, etc. with the goal of establishing rough equivalency between BCcampus & CCCS online courses. Listservs & wikis were set up to facilitate discussion & provide an easy-to-edit space to compare documents. Its worth mentioning that much of this work is being done in the open and can be seen on the NANSLO wiki. Discipline panels have been working toward an 80/20 version of these courses where 80% of the curricula used in BC and Colorado is common and 20% is localized or unique to the jurisdiction. This 80/20 approach is an intriguing idea and one I hope to see more generalized in OER development around the world. It is especially exciting and important to see team-based OER development happening across institutions and countries. A lot of discipline panel discussion is focused on the labs and in particular what labs might best be done using the RWSL. The BC versions of these science courses were designed to use lab kits for some experiments and the RWSL for others. The Colorado versions of these courses were using lab kits for all experiments. The question becomes what learning outcomes are best achieved through lab kits and what learning outcomes are best achieved through RWSL. Its important not to be thinking that all the labs are done through the RWSL. A lot of discussion I’ve been involved with essentially pits RWSL head to head against lab kits. At the NANSLO workshop last week we talked about reviewing the labs with an eye to what labs are best done through lab kits, what ones through RWSL, and even what ones might best be done via simulation. I think this approach of optimally blending lab kits, RWSL and simulations has the greatest potential. What we also need is to instructionally design a pedagogical approach for teaching science online using this blend. An interesting aspect of the lab discussions has been the realization that learning objectives are usually established at the course level. Rarely are there specific learning objectives associated with specific experiments or labs. So while some faculty may believe that the acquisition of fine motor skills required to operate equipment such as a microscope are essential it’s not always the case that such objectives have been documented as course requirements. Discussion around objectives for labs has also led to consideration of whether additional learning outcomes should/could be added around digital literacy and acquisition of skills associated with remote control of instrumentation. Science work in all professions is increasingly requiring these kind of competencies. I’m particularly heartened by discussions like this that don’t just view the RWSL as having to accomplish the same learning outcomes as are achieved on campus but also consider learning outcomes that the RWSL enables that are different from, or go beyond what is accomplished on campus. As this work has unfolded its become increasingly clear that faculty need a sandbox/development RWSL environment where they can get hands-on experience using the RWSL. A sandbox development environment will allow faculty to explore what is possible and come up with improved lab designs and conceptualize additional lab experiments. This need for a development environment is challenging for our project. The hardware and software purchased so far is totally allocated to programmer/technician development of experiments and a production environment where the RWSL is being used by students in real courses. We’ve not had the budget to acquire a full set of RWSL equipment for a sandbox/development environment. Nonetheless we’re committed to finding a way to provide faculty with hands-on opportunities. For anyone who has tried to do development of this scale on a tight timeline I expect you know there are always lots of challenges. On the technical side, in addition to the need for a sandbox/development environment we have two other challenges (at least :)) One is managing bandwidth and dealing with latency. On the latency side we’ve had success using the RWSL across BC but have had latency problems with Colorado using the RWSL in BC. I think we’re getting close to solving that but it does reveal the need to optimize bandwidth utilization. Ideally we’d tap in to CANARIE’s big Internet pipes going across Canada to ensure the data is flowing through as big a pipe as possible. In BC access to CANARIE Internet pipes is managed for universities by BCNET and for colleges by PLNET. From what I’ve found out to date the RWSL in BC is currently on a 100 megabit pipe. Of course there are other bottlenecks – getting through firewalls at institutions, and the speed of Internet service students/faculty are getting at home through their ISP are also factors. Our tests of RWSL indicate that students need at least a 4 megabit per second download speed. Another challenge we have with the RWSL is the need to put in place a scheduling system. We need to be able to specify when the RWSL setup for a particular experiment is available for faculty to try or students to use for labs in courses. This scheduling system needs to allow for faculty and students (or groups of students) to sign up for a time slot when they plan to do the lab. Part of our discussion around this has been whether the scheduling system needs to be integrated with the Learning Management System (LMS) being used to deliver the online courses or whether it can be separate from the LMS. There is also an authentication and logon component. If you have recommendations on scheduling systems let me know by commenting on this post. Not all the challenges are technical. Articulation and transfer of credit are particularly thorny issues. 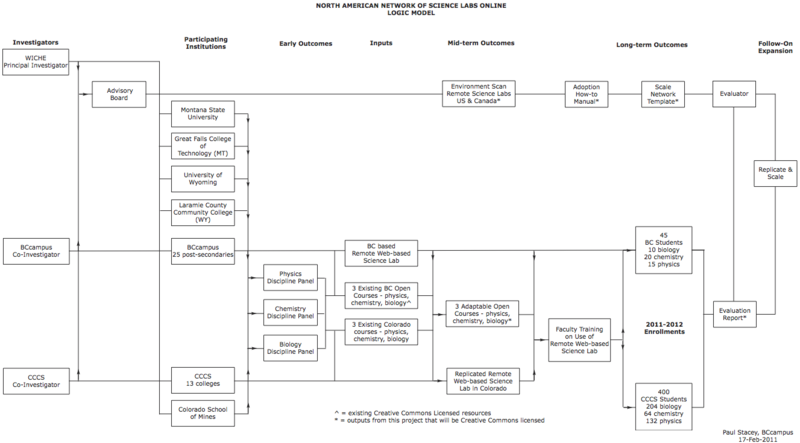 The logic model below shows a diagram of our activities (click on it to make it bigger). relieving wait lists associated with on campus science courses, where the constraining factor is often the availability of physical lab space, by using RWSL labs in existing campus-based science course offerings – articulate just the lab? Welcome comments and expressions of interest. And finally I’d be remiss if I didn’t acknowledge all the people involved in this project. I especially want to thank my BC colleagues Albert Balbon, Ron Evans, Gina Bennett, Mike Valmorbida, the BC faculty on discipline panels and the involvement of North Island College and College of the Rockies. Working with our US partners has been fantastic, we’ve got a great team – a special thanks to Pat Shea, Rhonda Epper, Dan Branan, and Catherine Weldon, CCCS, WICHE and our Wyoming and Montana partners. To NGLC and the Gates/Hewlett Foundations thanks for supporting this initiative!